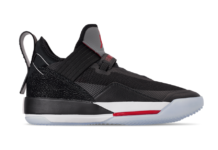 Jordan Brand is going stealth mode with their latest Air Jordan 33 release that comes dressed in a Black, White, and Dark Grey color scheme. Look for the Air Jordan 33 “Utility Blackout” to release on November 29th at select Jordan Brand retailers and Nike.com. The retail price tag is set at $175 USD.